Kris Kristofferson came first. At the end. A slow pull-back, with Nobody Wins playing over the scrolling credits. I’d had the Savages story pinballing around my brain for a while, but hearing Nobody Wins gave me that final scene. It underscored the logic of the story, seeped into the characters and themes. It unspooled the narrative backwards, giving me the focus to go forward. If some kind director (Shane Meadows or Danny Boyle, please) makes a film of the book, I would insist they pack the soundtrack with the music I used to fuel the writing. Because, for me, music isn’t a lubricant or a catalyst. It’s central to the story of a novel’s creation; as crucial as the ramblings in my notebook app, the epiphanies in the supermarket queue, the drafts and redrafts. I know some writers like silence or white noise or Brahms or Schubert or Eno, but I can’t make it happen like that. I need the mood of the music to match the tone of the scene, and, while I’m at it, I like to transpose the tunes into a fantasy soundtrack of the movie of the book. (Actually, let’s go for Ben Wheatley.) With Savages, that meant the wall-of-sound headrush of Blanck Mass for the final five chapters, Mark Pritchard’s ominous minimalism for the bad blood of the mid-section, and the cataclysmic crunch of Johan Johansson’s The Beast for a pivotal scene that I wanted to read like the slow and pitiless turning of a torture-rack wheel. 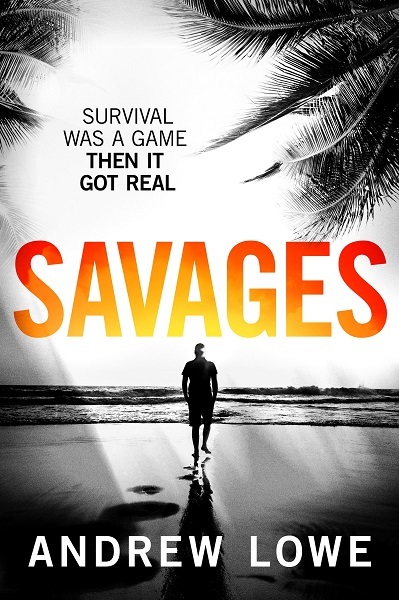 Savages is the story of Joel Pearce, a suburban GP who’s looking to shake up his routine. He receives an extravagant gift for his fortieth birthday: a ‘desert island survival experience’ and, despite being a creature of home comforts, he rises to the challenge. Together with four friends, he travels to a remote tropical island in the Philippines for three weeks of indulgence and self-discovery. I read plenty of genre thrillers; mostly crime and psychological. When they’re good, they can be very, very good, but when they’re bad, they can feel like dressed-up research or algorithm-friendly templates, hacked out from the walls of the deepest data mines. Over the last year or so, the most interesting books I’ve read have dabbled with fusion. The author has taken a little from this genre, a dash from that, and moulded their story into a lateral but nourishing whole. I’m thinking of Elan Mastai’s All Our Wrong Todays (sci-fi romance), Sara Baume’s Spill Simmer Falter Wither (one man and his dog and the human condition), Adrian J Walker’s The End of the World Running Club (post-apocalyptic existentialism). With Savages, I wanted the fusion to come from a tweak to the three-act convention. Act One is character study; family and relationship drama. Act Two is a psychological thriller; mounting tension, known unknowns. Act Three is all-out action thriller, bordering on horror. And it’s all served up with a twist inside a twist which came from that Kris Kristofferson eureka! moment. And when I had to glue myself to the writing chair in the middle of a dark and dismal winter, and cook up scenes of heat and light and powdery beaches, I turned to old YouTube, where some kind soul had stuck a static camera under a palm tree and captured an uninterrupted hour of the kind of desktop-background fantasy island described in the book. Outside my window, the North London streets glittered with frost, but in my writing cave, I was transported, tapping away to the sounds of chirping cicadas, rustling palm fronds, cresting waves. The soundtrack helped me to create an authentic bucket-list dreamworld, which I could take great pleasure reshaping into a nightmare.